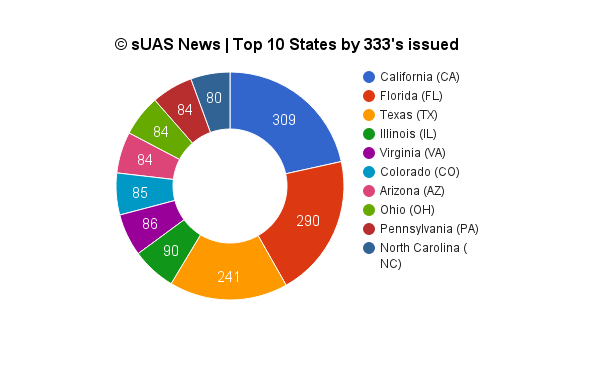 Tiaan at sUAS News has recently updated our interactive map of all the current 333 holders ahead of our first guide coming out. From watching how things grow we can see that the FAA can handle about 300 and a bit new entries a month so sometime soon the number of individual companies will reach 3000. The FAA website will give a bigger number than that sooner but they add one when people get amendments so its a little misleading. Some companies have had three or four amendments so might count as 4. I guess the number of dots on the right of the map tells us that's where all the people are even though California has the most 333's issued. It begs the question of when SFAR 107 is adopted, will all these companies have to reapply again or will they be at the head of the queue for the new system?? Quicker I hope, I know they have employed more folk. BTW, if you have a pilot's license you can fly under someone else's exemption. I'm an American Expat certified in Australia, any chance of moving back to the USA and have my Australian certifications and experience translate over to the US system? Not until SFAR 107 goes through. If you have a manned flying qualification it will help though. A couple of European companies have jumped the pond but with US citizens filling the flying posts. Your experience of course will travel anywhere! Im trying to find some recent articles about SFR 107 but not coming up with anything. Is this the rules for UAVs that the FAA supposedly is going to release in 2017?